(Newser) – The former head of the IRS division that targeted Tea Party groups has once again been brought before Congress—and once again refused to testify, as her lawyer warned would happen. Lois Lerner cited her Fifth Amendment rights against self-incrimination at a hearing today before the House Oversight Committee, the AP reports. Her lawyer says he told committee staff in January that if Lerner was called on to testify, she'd take the Fifth, the Hill reports. 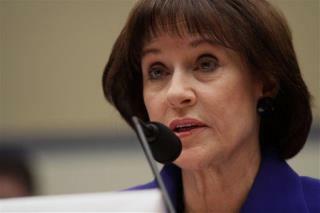 Chair Darrell Issa last Tuesday called her to testify all the same. This witchhunt that Issa has been on is nothing but the Right stirring up something out of nothing. The REPUBLICAN that was responsible for the decision to check out these groups told them there was nothing nefarious going on and that the White House had nothing to do with who was checked out. And that he would testify to that, but Darrell Issa won't call him to testify. Issa is nothing but a corrupt, Lebanese camel-driver who lacks anything resembling a conscience. He spends the taxpayers money on these farces he calls 'investigations', and tries to drag them out as long as possible. He should never have been elected to Congress in the first place with HIS track record. But, when you're the richest man on the Hill, I guess you can keep buying your way to re-election. Did she call the FBI ? File a police report ? No ? I wonder why someone wouldn't do that ??? Hmmmm...Maybe because the Administration is at the top of the food chain being treatened ?...and she has a choice to make ? Cry Me A River, Traitor. Obviously she's corrupt otherwise there is nothing to hide or lie about or take the 5th for.